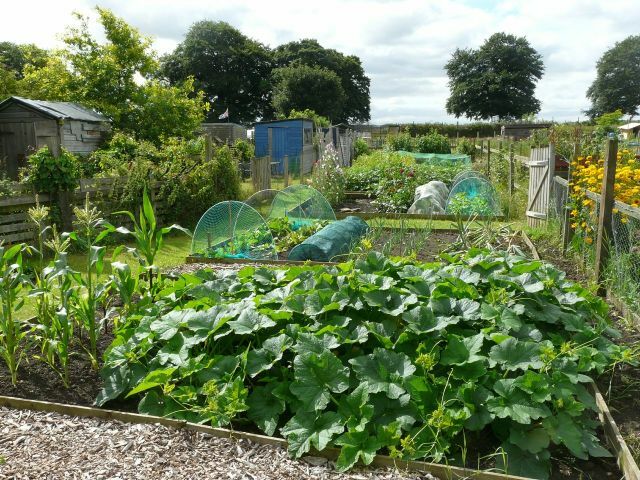 Ah well the summer holidays are drawing to a close and after a couple of weeks off on holiday and Bramham Festival we are back on the allotment tidying up and seeing what has been growing while we have been away. Allotments are another thing to have to plan for when we go away on our holidays. Luckily the lady I have used in the past to tend to the girls while we are away, who runs Pals 4 Paws a dog walking/chicken minding business in the area (recommended), has taken up the plot next to ours and has chickens of her own so she was more than happy to check on ours every day as she was up there anyway. Another friend on a neighbouring plot offered to water our tomatoes as we had done hers earlier in the year. So it was nice to go away knowing that everything was to be cared for while we were away. After such a wash out at the festival I couldn’t believe how hot it was up there today, lovely but boy it makes digging etc. very hard work. I’m chuffed to bits with how everything is growing though. I have a fantastic crop of the sweetest cherry tomatoes which I use to make pasta sauce as there are too many just for salads. It’s great as I can freeze it and enjoy that lovely fresh taste of summer in the middle of winter. I’m taking up beetroot every week which is delicious, chard, kale, green beans, lettuce in fact I don’t think we eat a meal without something from the allotment included. Next on the menu will be our sweetcorn which is looking very good and then the pumpkins. I think I said in an earlier blog that they weren’t as rampant as the others we grew last year, well that isn’t the case. They are growing out of the bed on every side and have created a massive dome of foligage, now twice as big as the photo. When you part the massive leaves and look inside the dome you can see the little pumpkins beginning to form, some are actually quite large now and are starting to take on the distinctive colour of this variety which is pale green with dark green stripes, can’t wait. Because it has grown out of the bed most of the fruit is actually laying on our bark chipping paths which is great as that will stop the fruit from rotting underneath. Those that are on the ground will need to be lifted soon and placed on a brick or something similar. At the other end of the plot is the brassicas that are now growing so tall that they are straining against the mesh we put over them to protect them from the cabbage whites. I’m going to have to find some taller stakes to make another cage for them. Ah yes back to work with a vegenance, so many jobs to do! After we had finished today we took the opportunity to sit on the bench and admire our handiwork. The girls also decided it was time for a rest and settled down around us for a groom and forty winks. It was so lovely sitting in the sun watching them all fluff their feathers up and get their beaks into their feathers to give them all a good clean. They are looking really well at the moment and it’s just nice to relax with them like this. Now the nights are drawing in it means we can come and attack them once they have gone to bed with the mite powder which is so much easier than chasing them round the pen but for now we’ll leave them alone to enjoy their grooming.